O (Observation): The Lord lays out the path that brings us life and rest. Yet, God’s people have found their own ways…ways that have caused unrest and, ultimately, their downfall as a nation. They did not fall away from God. Nothing can separate them from the covenant God has established with Hid people. They’ve simply lost there sense of spiritual and physical rest. They’ve lost the ancient paths. A (Application): As a congregation, we will be embarking on a series called Animate: Practices, which is a re-introduction to the ancient paths (or, practices of the Christian faith). Something about abiding in Christ gives me the desire and permission and joy of searching the ancient paths and seeking the rest that God promises for my soul. Now, I will have to say that none of us gets this right 100% of the time. Yet the promise of rest remains. And another point of transparency is that bad stuff will happen on our journeys. But again, the path is there for us. Now, sometimes traveling on the path can be a lot of work, but a work that gives us a deep peace in our souls. Have you found the work that brings you peace? What is it? It can be hard on your body or mind, but still bring a deep peace. Does your job help to satisfy your soul? If not, what can you change? 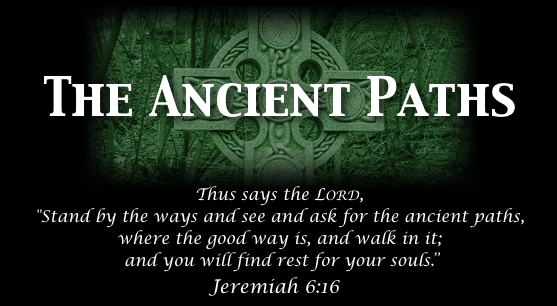 P (Prayer): Lord, guide us into the ancient paths, paths that lead to life. Amen. This entry was posted in Digging Daily and tagged Ancient, Jeremiah, life, Path, Work. Bookmark the permalink. Singing choral music brings me peace. There is something about singing with others that lifts me above my circumstances and gets me in touch with God.